(Washington, DC) October 7th, 2008 -- A new, patented service gives advertisers access to the rapidly expanding base of iPhone users, for linking traditional print, broadcast, and other “offline” advertising to an advertiser’s targeted online promotions and microsites, through a new iPhone interface developed by Internet Media. With the launch of Internet Media’s optimized Jump Code System iPhone interface, users of Apple’s top-selling iPhone can now use their iPhones to enter Jump Codes, printed in advertising, shown or spoken in on-air ad spots, or displayed in out-of-home advertising, to reach any targeted Web location at any “deep URL,” to access promotions, in-depth product information, or any interactive feature available on the advertiser’s Web site, without having to enter long and difficult Web addresses on their iPhone’s on-screen keyboard. With Jump Code access, advertisers can now make any traditional print, on-air, or other advertising campaign fully interactive, by linking iPhone users (and users of any other smartphone, Web-enabled mobile device, or PC) instantly from their ads to their targeted Web locations or microsites, to engage consumers by motivating them to respond immediately at their peak interest in the advertiser’s product or service. Advertisers can now target this base of over 8 million iPhone users, as well as any other smartphone users, by developing Jump Code-enabled mobile advertising campaigns. 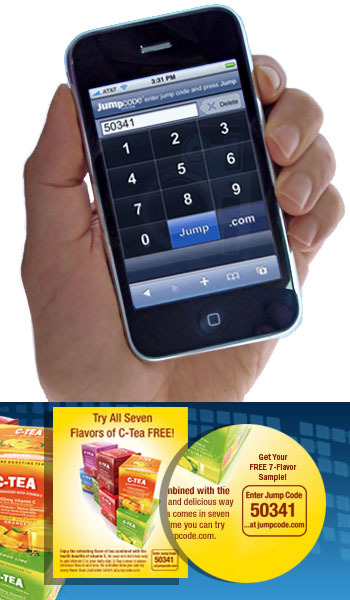 With Jump Codes, iPhone users now have easy, instant access to the savings offers, product details, or any other Net-accessible feature they see referenced in advertising, and can reach these locations instantly by simply entering a short, five or six-digit Jump Code instead of the frustrating task of having to enter these very long URLs by hand. In addition to iPhone access, the Jump Code System also provides a new mobile advertising platform for advertisers who currently use Common Short Codes (CSC) in text messaging mobile campaigns. By adding Jump Codes that match their SMS short codes, advertisers currently running mobile ad campaigns can provide a richer, faster, and more effective access experience for consumers using iPhones and other smartphones. Advertisers looking to launch into the rapidly expanding mobile advertising market can also utilize Jump Codes to reach consumers using smartphones or any other Web-enabled device. 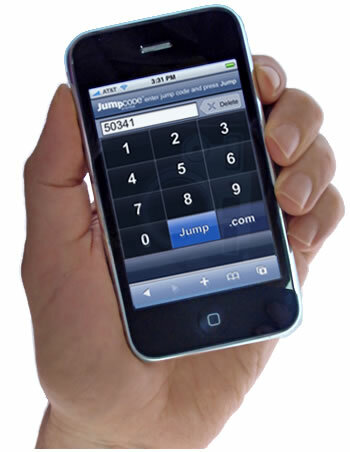 As an “open movement” Internet access feature for mobile advertisers, Jump Code access enables advertisers to reach a large and growing base of smartphone users, such as iPhone users, via direct Internet access, without the delays associated with provisioning SMS-based mobile campaigns, at lower cost, and in less time with Jump Code-based mobile campaigns. To implement advertising programs utilizing Jump Code access, advertisers, or ad agencies and mobile ad agencies working on their behalf, can lease Jump Codes from Internet Media’s registry, at www.jumpcodesystem.com, linking their desired Jump Code to the Web locations for each promotion or other consumer destination, and then utilize Jump Codes in all of the media used in their advertising campaigns: Print advertising, direct mail, broadcast television and radio, out-of-home, or special event promotions. Once launched, Jump Code-enabled advertising programs can link iPhone and other smartphone users, to special savings promotions and coupons, detailed online product information, rich-media video presentations, contests, or any other interactive, Internet-based feature. For more information on the Jump Code System, visit Internet Media’s Web site at www.JumpCodeSystem.com.